Want to have your own lightsaber? Don't want to spring for the top of the line lightsabers? Have a printer? Star Wars.com has you covered. 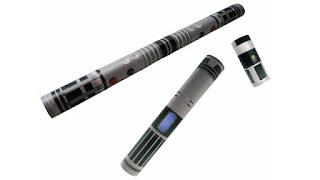 You can literally print your own Jedi, Yoda, or even Darth Maul lightsaber with this papercraft from the official website. Would you print your own lightsaber? I need to pass this to a friend that has the light saber sound app on his phone. Then he won't look so silly just swinging the phone. That's awesome. There are so many awesome printables on the internet these days. I have always used wrapping paper tubes for swords. Now I can print this and get away with whacking my wife and kids. By get away with I mean whack and run!